The Valley contains Seeley Lake, Swan Lake, and Holland Lake. Seeley Lake Ranger District - Lolo National Forest. 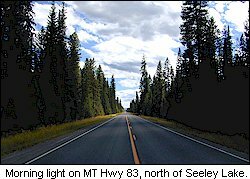 3583 Highway 83, Seeley Lake, MT 59868. Phone: 406-677-2233. The Lodges On Seeley Lake. PO Box 568, Seeley Lake, MT 59868. Toll-free: 1-800-900-9016; Fax: 406-677-3806. The Double Arrow Ranch, named after a brand on the founder's favorite horse, was established in 1929 and became the first commercial dude ranch to be located at Seeley Lake. Accommodation in private log cabins overlooking picturesque Lake Upsata. Offers programs for children, wildlife programs, horseback riding, and fly fishing. Swan Mountain Outfitters. PO Box 5081 Swan Lake, MT 59911. Phone: 406-886-3900; Toll-free: 1-800-919-4416.